Summer is right around the corner and that only mean one thing...Fun in the Sun, sand and Sea! The same essence captured in this year's Under the Sea collection by Build-A-Bear Workshop. To say these cuddly animals are cute would be an understatement. In fact, they are a delight to see! It kinds of make you want to hit the beach each time you look at them and swim like a Mermaid or Merman perhaps. But we can't help play favorites. Our top choices are the Deep Blue Splash Bear and Oodles of fun Octopus. Just like the deep blue sea, this bear is very mesmerizing. Its body is adorned with cute sea creatures that instantly creates a tantalizing visual display that easily identifies it to that of an aquatic life Under the Sea! 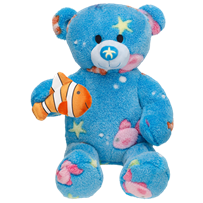 This bear also features an embroidered starfish on its nose and embellished with a cute removable clown fish buddy on its paw. Its fabric is cuddly soft like a soft beach towel. A great travel buddy on your way to the beach! And a great welcome to the Summer gift for your ocean-loving little wee ones too! I should know. My not-so-little-wee-one love hers a lot, like how a mermaid loves her sea shells! One word. CUTE! Yes cute to the 1st degree. A little mermaid's bestfriend if you ask me. And I'd say a must-have for every little girl who loves pink! There is nothing about this cutie that is not cute. Even its tentacles are cute. It is adorned with sparkly pink fabric and silvery dots. And its two upper arms are embellished with embroidered circular designs. Its body is covered with fluffy fabric and comes with a removable sand dollar buddy! This Octopus certainly embodies every bit of fun. Oodles of fun! I personally love it. I do believe that this would make a great buddy for every fun-loving, sea-loving little mermaids in your kingdom! My little mermaid is surely having a blast with hers! Check out the rest of the collection. There's something for every little mermaid and little merman in the kingdom. And whatever you chose, they're perfectly cute and adorable in their own little ways!